Also we beat up on Forum 62 a few episodes ago. 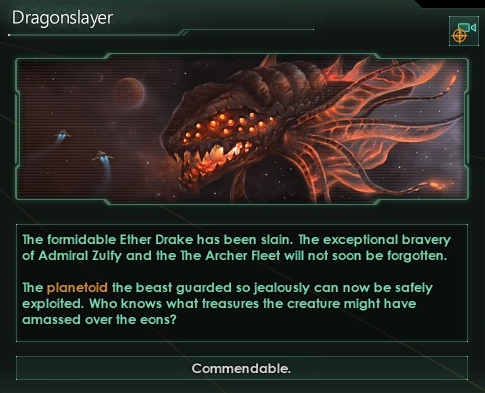 What happened to the other space dragon? The green path beautifully sketched onto the map by our top cartographers is the route our fleets would have to take to reach Postie territories. The red spider thing is obviously a portal, which would instantly bring us to Postie lands. 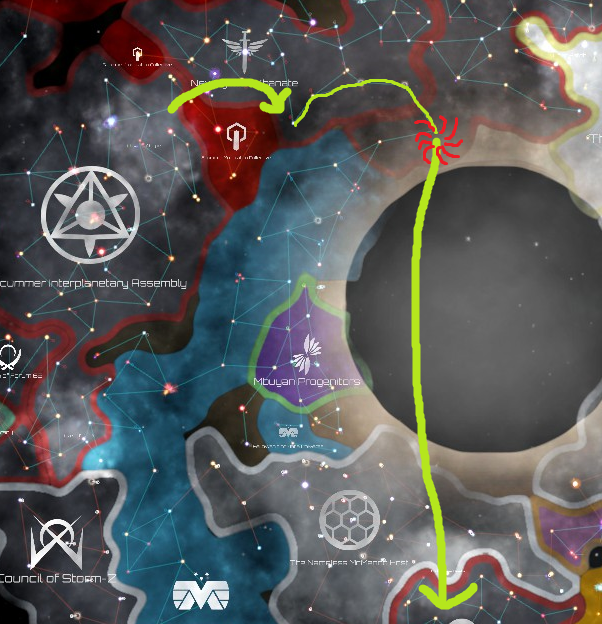 We cannot reach the portal without using our jump drives as the Scummer Moderation Collective stands in our way and has closed their borders to us, forcing us to jump. The duration of the entire journey from our docks the Postie capital takes us 569 days. Nonetheless, we set off. 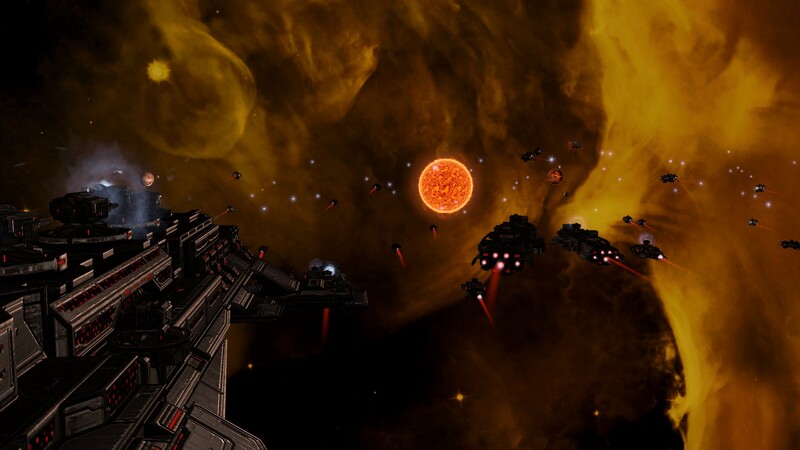 We would only dispatch half our fleet, although it wasn't strong enough to face the entirety of the Mafia-451 force alone it would be able to defend Postie systems for at least a number of years. 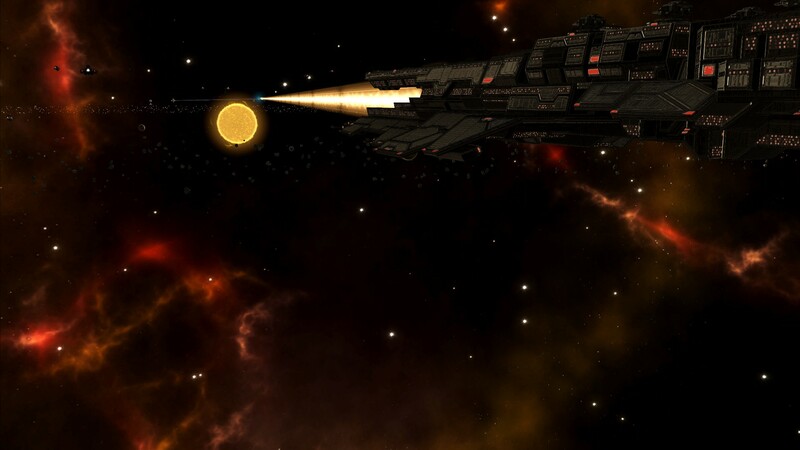 The main fleet, the Centurions, would be readied and sent off a few years afterwards as to replace the vanguard fleet and allow it to return to Scummer lands and repair as need fit. 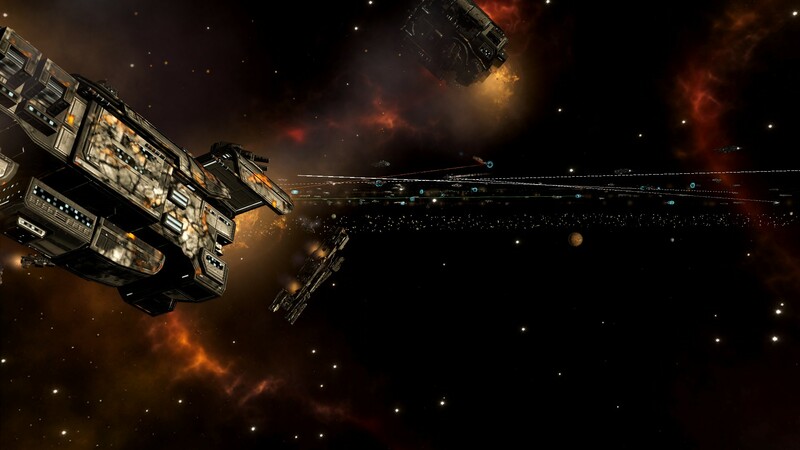 The federal fleet would also aid our efforts, although its total strength was but a quarter of our even our vanguard due to a sizeable majority of the ships being of our allies' make. Things didn't exactly go according to plan. 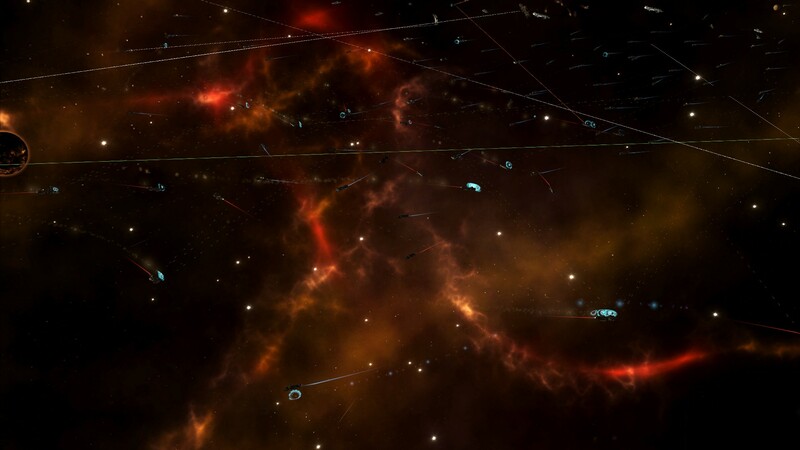 At a cost of roughly 70.000 Scummeran lives, a few hundred thousand of our allies, and a few million citizen Posties which died due to Mafia-451 bombardments upon their homeworlds. 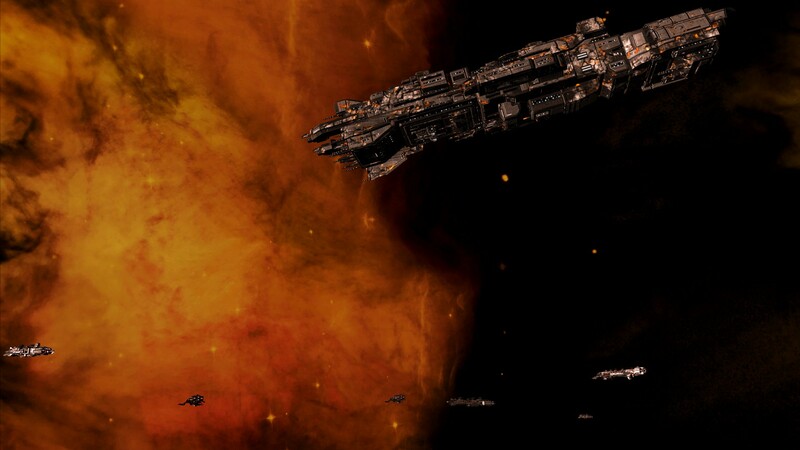 The vanguard fleet arrived first as planned and was able to stall the Mafia-451 onslaught, taking some significant losses in the process but otherwise remaining functional. This bought the Centurion fleet enough time to reach the Postie systems. Shortly afterwards the 451 rallied their fleets, forcing our vanguard to remain and join the Centurion fleet in head on combat. Although we were outnumbered, our technological advancements as well as our trump cards would prove to provide us with an edge. 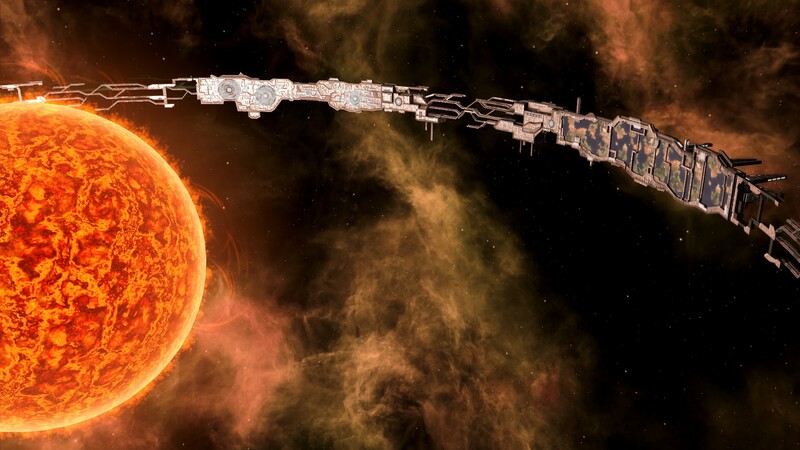 We have two recently developed Titan class ships capable of razing even the strongest of vessels with their Taychon cannons. It was a spectacular sight to behold, but for every blinding light hundreds if not thousands would perish. Although those cybernetically enslaved by the 451 have no independent thought, they still resemble the old husks of their former selves. Who knew if any shred of their sentience remained. 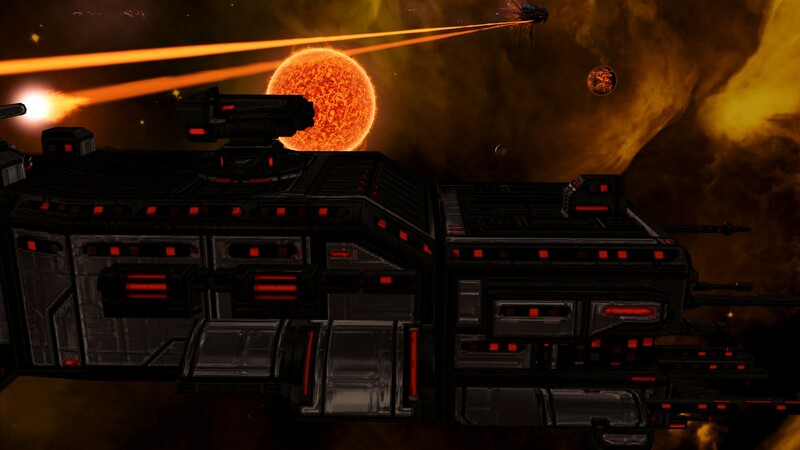 Having destroyed their initial fleet the Celestial Axis united their forces and liberated much of what had been former Postie territory, including their homeworld Postdyria. Their former home had been radically changed, all those that had been left behind mindless cyborgs that the Postie's were forced to kill. The cyborgs fought until the death, resisting all aid. And there were billions. The former paradisal cities had been replaced with sprawling industrial regions, scarring the once harmonious landscapes. Postdyria was a place they no longer recognised, their own kind their enemies. 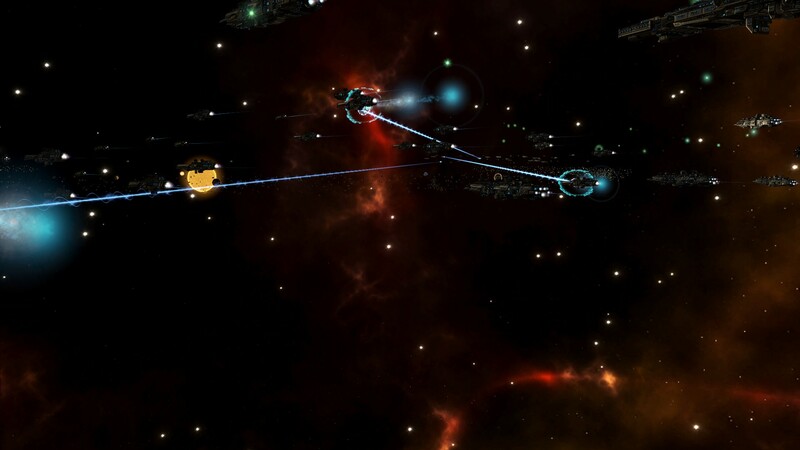 The war dragged on and came to a deadlock where both fleets were unable to push further into their rivals systems. 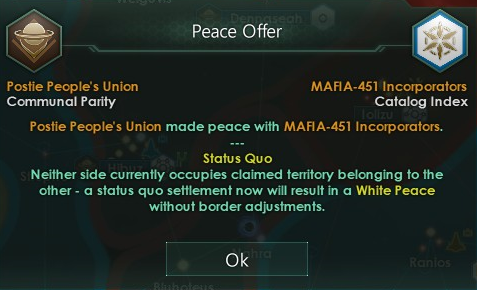 A white peace followed, and the war was over. I'm confused, how did the Posties regain their territory if it was a white peace? into the breach is so great. In post 229, Papa Zito wrote: I'm confused, how did the Posties regain their territory if it was a white peace? 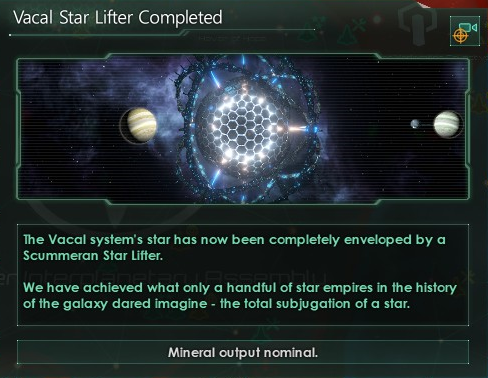 Genocidal Civilisation in Stellaris have the ability to take any star system simply by occupying it, in turn you can do the same. Usually you would have to lay down claims and then occupy the relevant systems to get them in a white peace. 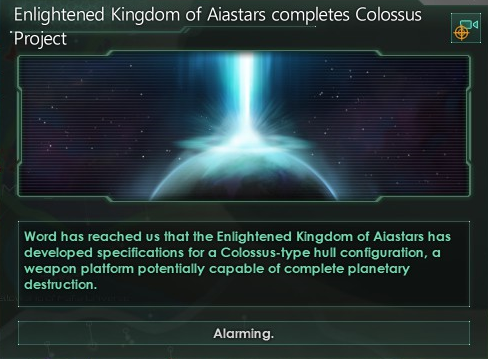 Wow, the mechanics are pretty different from EU4/CK2 I guess. It was going viral upon Scummeran social media, a video most incriminating... of our very own president. Maestro had been seated for 80 years now, uncontested as he had lead the Scummer Interplanetary Assembly through a time of greatness and stability within this volatile galaxy. He apparently held a strong distaste of Half-Scummers, those descended from that wild party with space traders a few centuries ago. Under the influence of alcohol he was caught saying some inexcusable comments about their kind. The Half-Scummeran community is understandably riled as a result, and those of the Alien Compassion Watch are backing their plight. They demand Maestro to step down and for new elections to be held. Maestro ceded his position voluntarily, wishing his successor well and apologising for his errors. He withdrew himself from the public domain. An election was then called, the first one that could prove interesting in almost a century. The Free Thought Council still held overwhelming sway over the Scummeran people after having brought so much welfare and advancement to our peoples. They had proven wise rulers, that listened to the citizens of our planets and stood up for what they held to be true and correct. 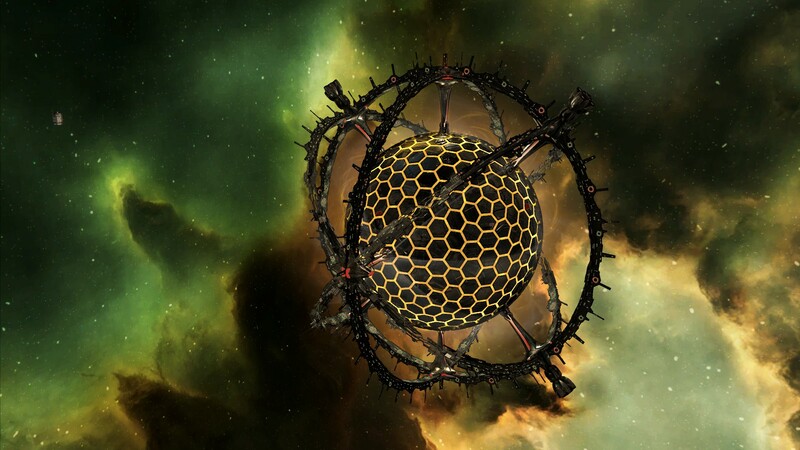 Draynth, a governor of our most distant sector won the primary for of the Freedom Foundation. He was polled to win 41% of the votes. 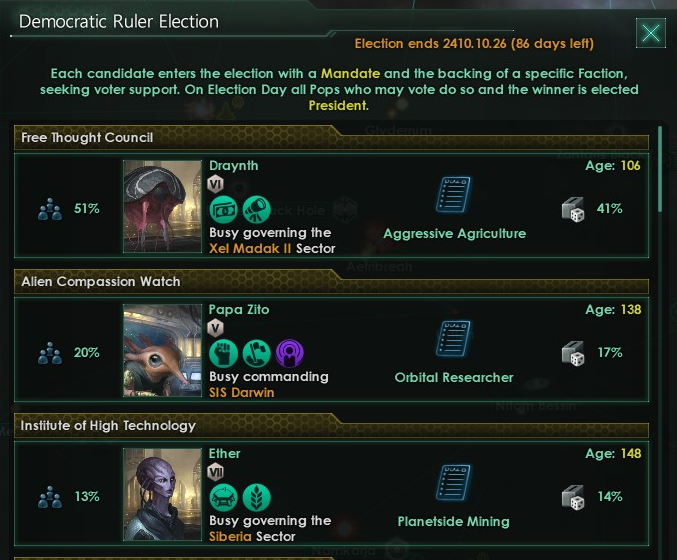 His main rival was Papa Zito of the Alien Compassion Watch which was seeking to capitalise on the unexpected turn of events, he however was only expected to win 17% of the votes. 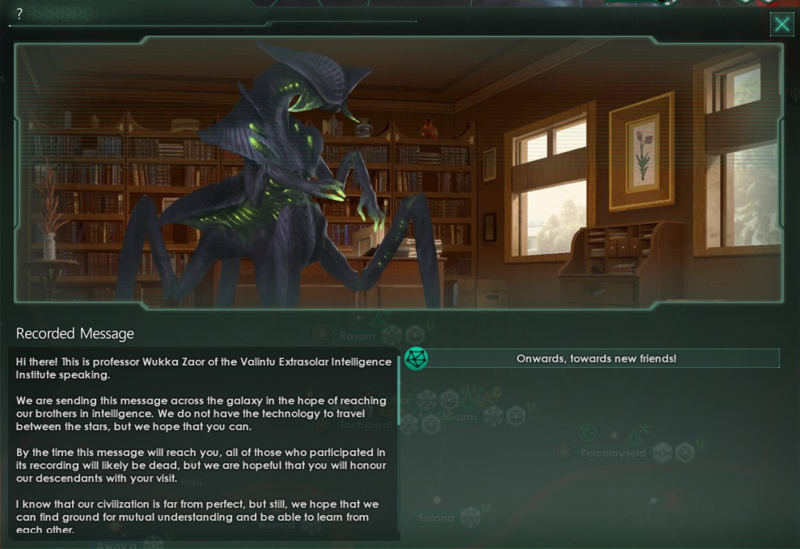 The Institute of High Technology was predicted to win the third largest portion of votes, governor Ether expecting to net 14% of the vote. Draynth was a governor of a largely rural sector, producing a large portion of the organic material needed by the Assembly. He had campaigned for agricultural reforms as to create many new job opportunities as well as protecting those currently in the sector from the rapid automatisation. Papa Zito on the other hand promised to continue the rapid technological advancements Maestro had spear-headed, believing that doing so would bring welfare to all Scummers. The votes were counted and Papa Zito was declared our 13th president! 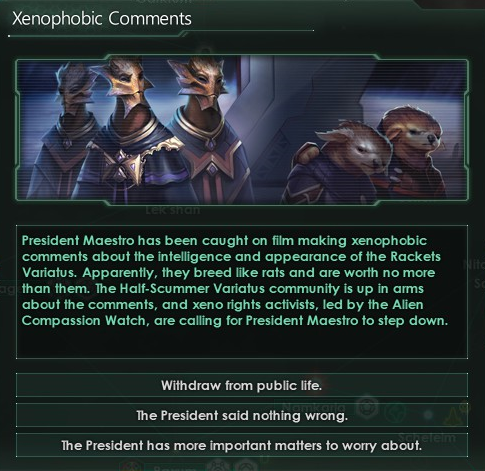 The Alien Compassion Watch had successfully won over the voters hearts and dethroned the Freedom Foundation. As promised, Papa Zito made sure all current projects were carried on as well as funding research into experimental technologies. 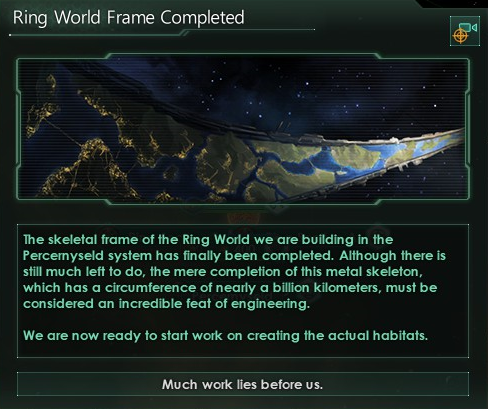 During his first few years the frame of the first planned ring-world had been constructed around a star. 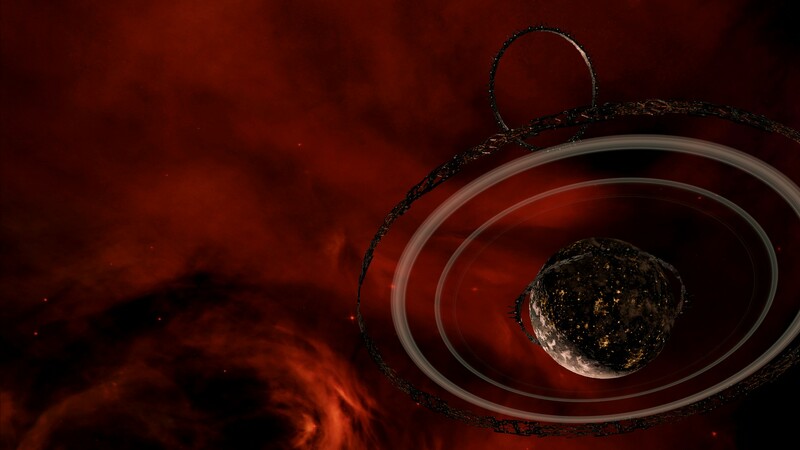 The project aimed to create a ring which could house artificial habitats for hundreds of billions of Scummers to live in, powered by the energy of the star it encircled. Day/night cycles would be regulated artificially through giant screens. 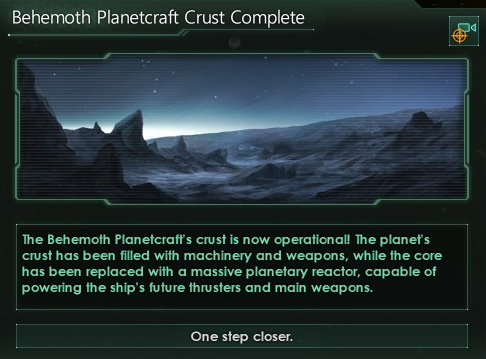 Another 5 years later the first such habitat of 4 planned was completed, and a colony ship was readied to house the first Scummers in this marvel of science. 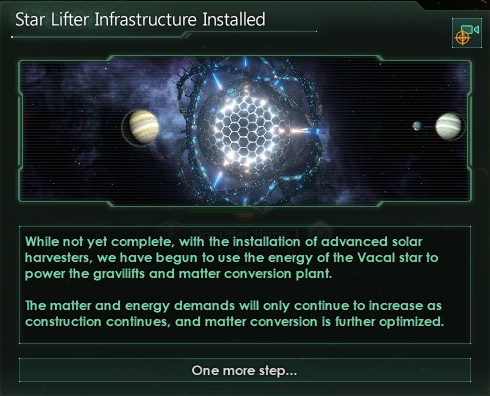 Further progress was also made on the Star-Lifter which was now capable of providing resources at an already impressive scale. It was not yet complete and only working at a fraction of its final estimated capacity. 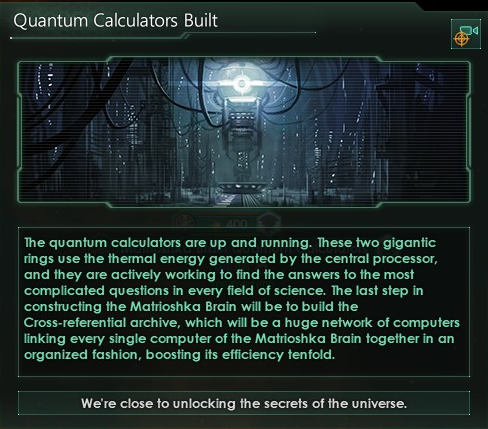 The Matrioshka Brain was also nearing completion with the installation of a central processing unit as well as quantum calculators. Already the computational power of the brain was beyond anything our researchers could have dreamt of, significantly boosting their ability to conduct complicated research and solve complex theorems. 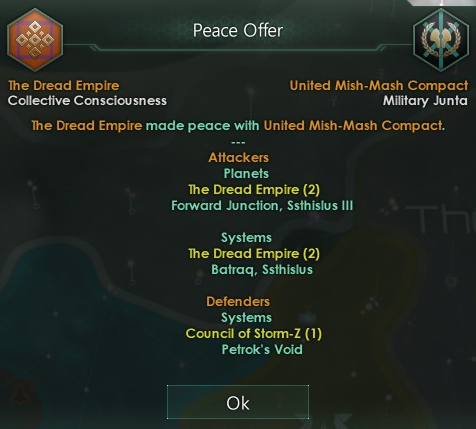 On the galactic stage the Dread Empire had made peace with those of Mish-Mash. 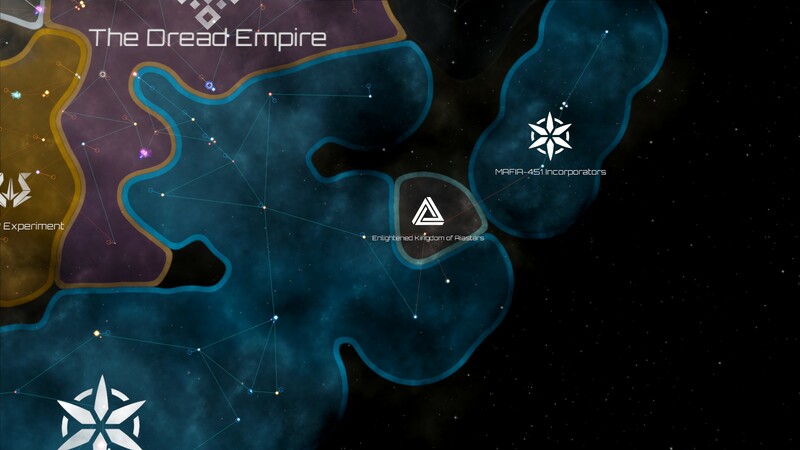 Their sneaky attack on them shortly after the war with the Wortsarians had netted them a large chunk of territory, furthering shrinking the size of the Mish-Mashers. As you'll soon see, it may be the U'i that do so. 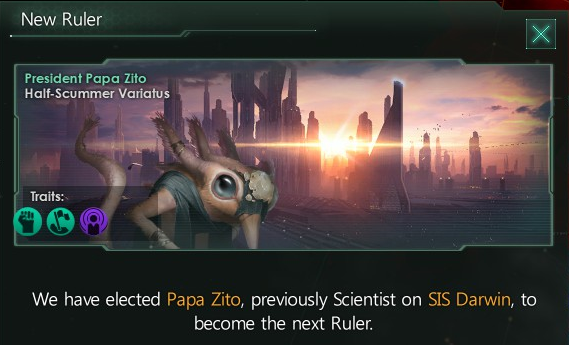 The decade that follows Papa Zito's election for president is a decade of change, shifts in the status quo so violent the galaxy will never be the same again. Change is coming, and nobody quite knows what the outcome will be. 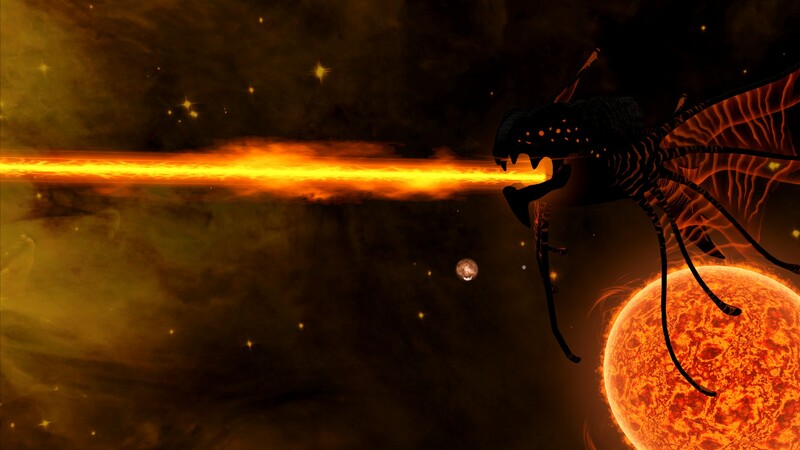 Tensions have reached a boiling point within the galaxy, and ancient powers awaken. 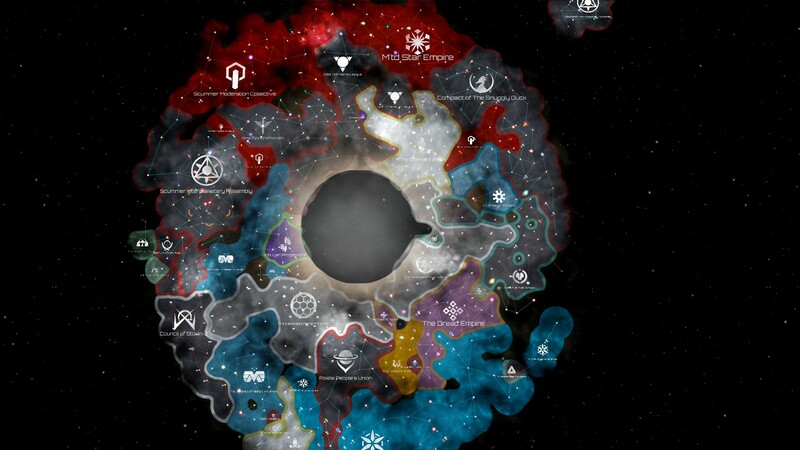 It started with a dramatic shift within the galactic political scene. 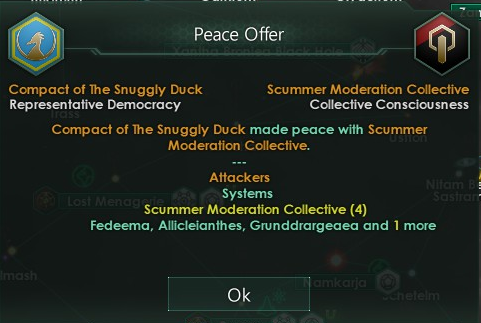 The Scummer Moderation Collective made peace with the Compact of the Snuggly Duck claiming a number of their systems. They had grown bored of the war and had now laid their ambitions elsewhere. The Collective had namely laid their eyes upon Mafia-451, and their neighbours the Mt'd which until now had been practically ascetic to all the happenings within the universe. Nobody quite knew who the Mt'd were beyond that they existed. 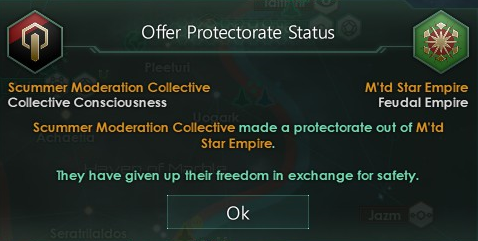 The Collective demanded that the Kingdom become a protectorate under their authority, a demand they accepted knowing they stood no chance in a war. 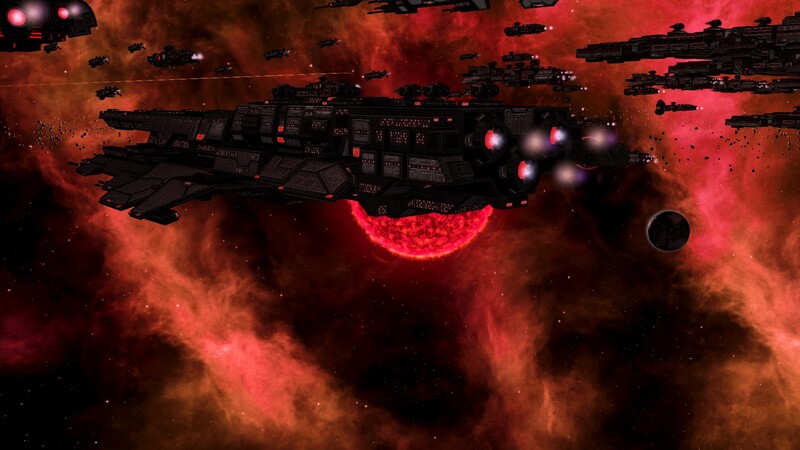 This granted the Collective access to extra manpower, which they used to build up their fleet even further. 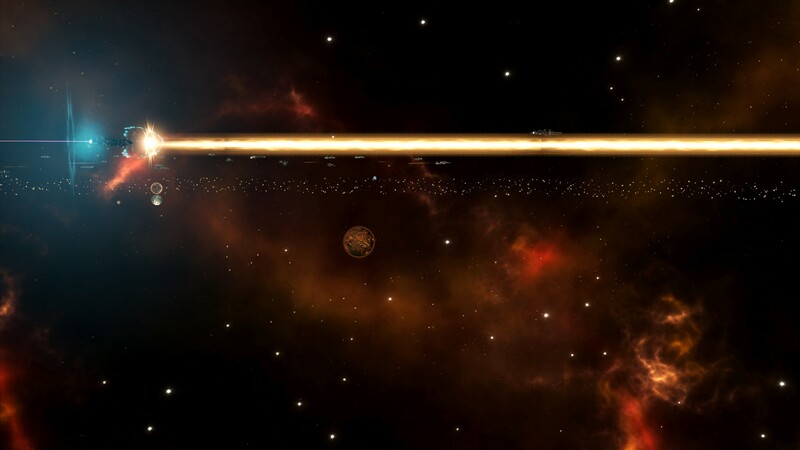 Making use of natural wormholes they then declared war upon the Mafia-451. 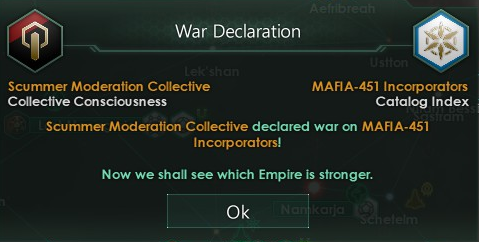 The outcome of this war may radically change the balance of power within our galaxy. 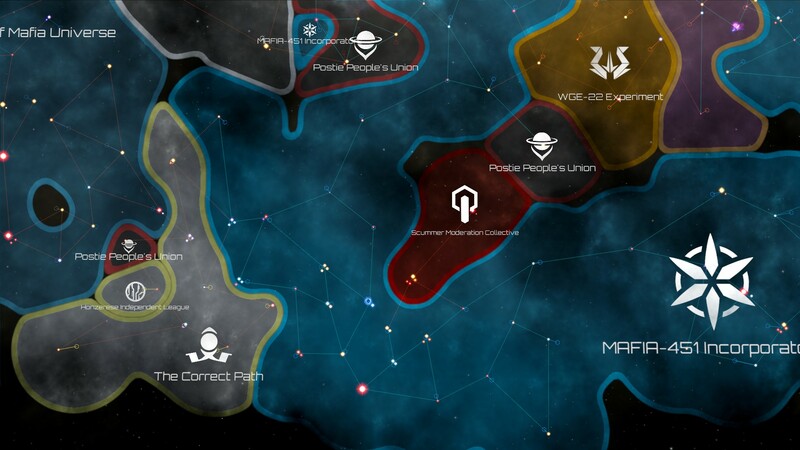 A flurry of further war declarations followed by other civilisations, the focus of the 451 now being elsewhere. This gave all a window to expand. 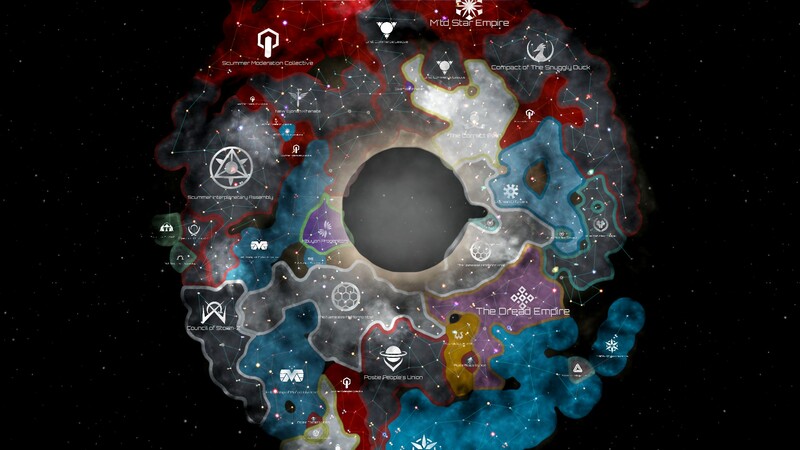 The Council of Storm-Z declared war upon Mafia Universe which had been losing territory and ships in their attempt to defend themselves against The Nameless. 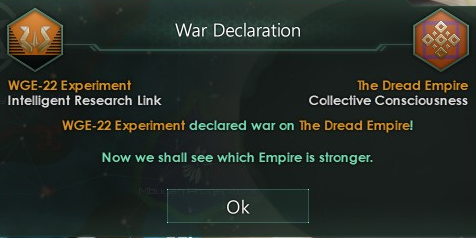 The WGE-22 Experiment which had largely abstained from conflict for now centuries declared war upon the Dread Empire. 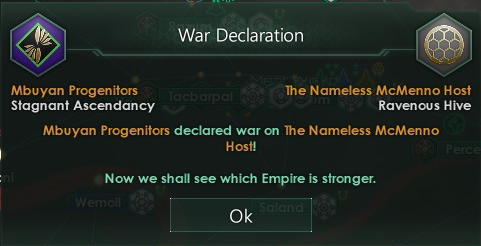 The Mbuyan Progenitors were displeased by the rapid expansion of the Nameless once more, and thus the Fallen Empire mobilised their forces once more to teach them yet another painful lesson. The fragile stability of the galaxy was falling apart. 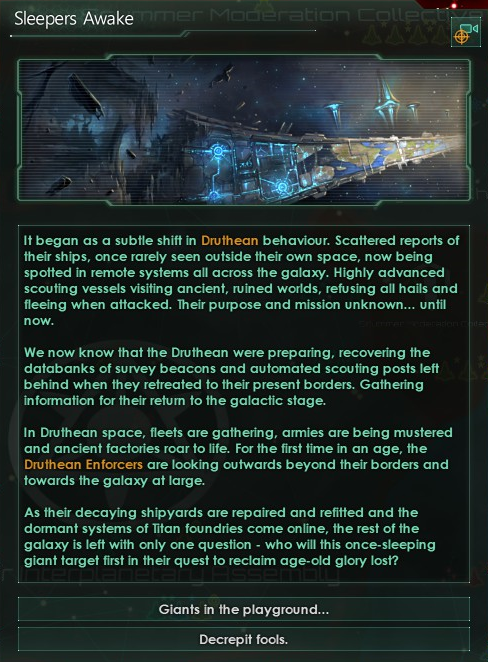 For the Druthean Enforcers had awakened. There had been reports of increased activity for numerous years, yet they had all been disregarded. No longer. Ancient shipyards were whirring back into action creating vessels armed with technology even we have yet to dream of. 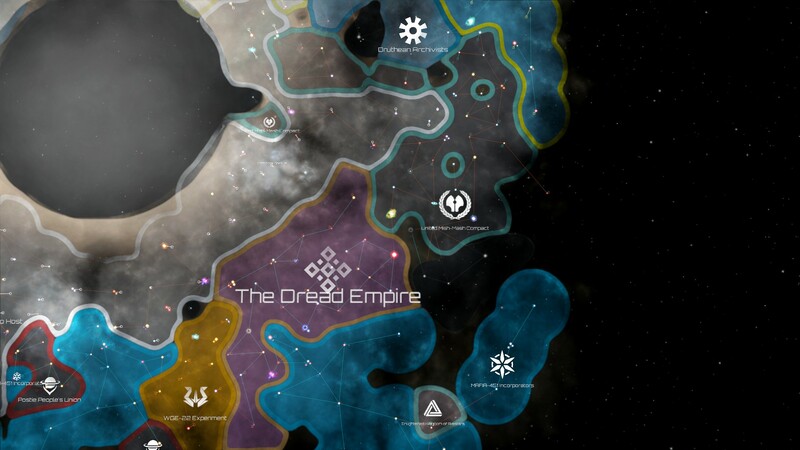 The Druthean slumber no more, they hunger for glory, they want to reclaim their place amongst the stars. Woe to all those that stand in their way. 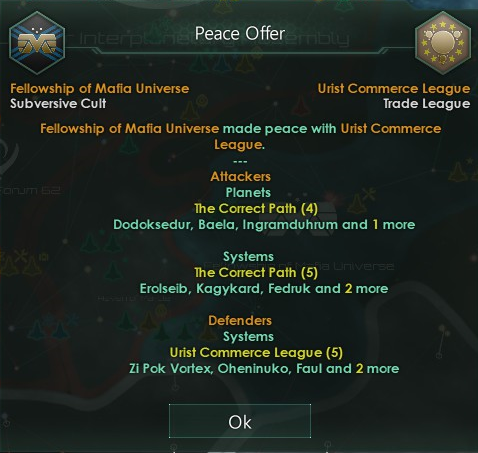 In reaction to the newly awakened super power Mafia Universe, which was allied with the Correct Path, made peace with the Urist Commerce League. 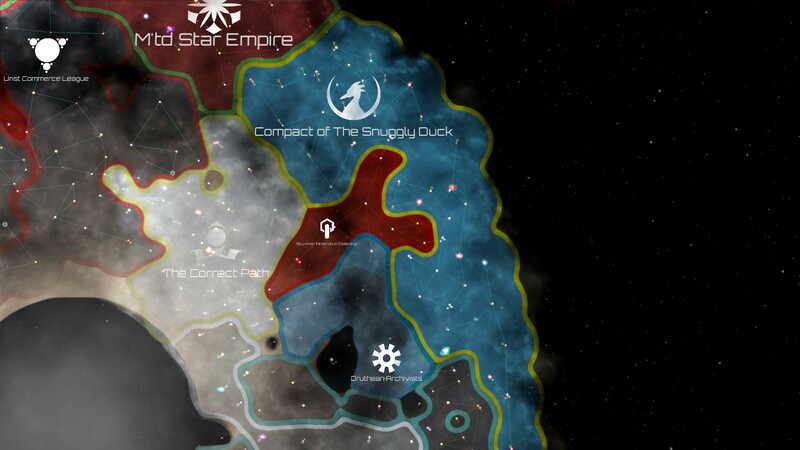 The Compact of the Snuggly Duck being one of the civilisations near the Druthean feared for their own, and was asked to join the Celestial Axis. 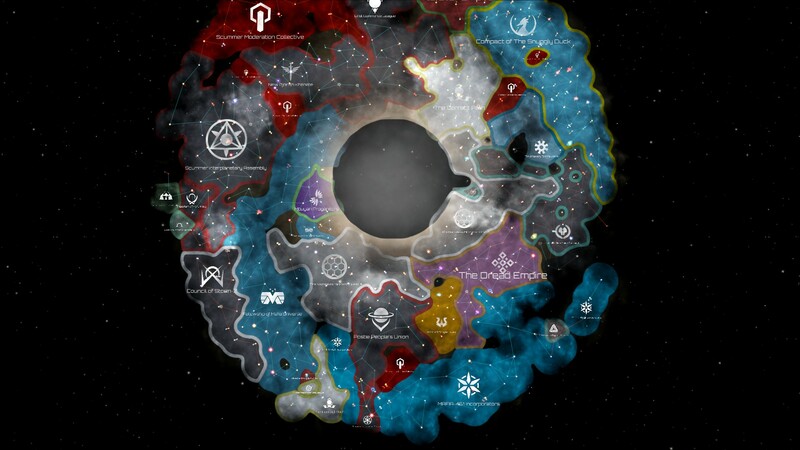 They accepted due to the aforementioned concerns, further expanding the federations galactic reach. Locally we were also experiencing impressive change. 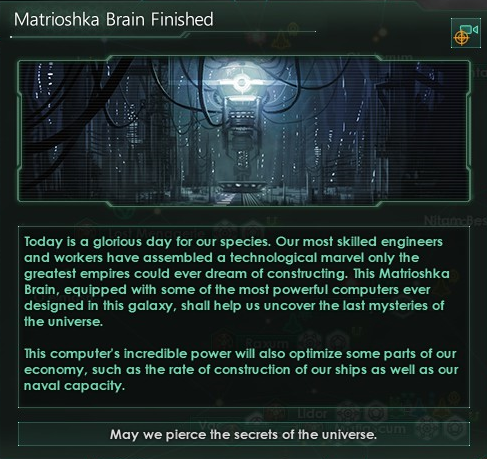 Both the Matrioshka Brain and the Star-Lifter were completed, granting us access to both immense research capabilities and minerals. 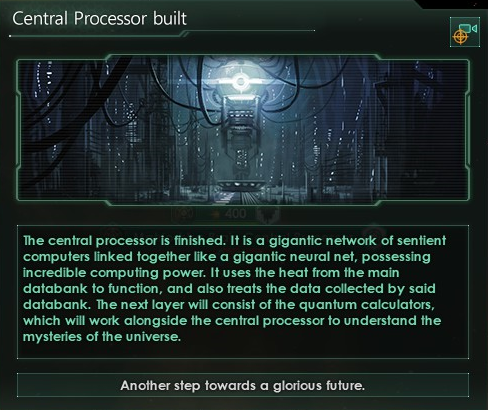 The computational power was so strong it sextupled our research productivity, and a rapid spree of breakthroughs in many fields followed with no sign of slowing. 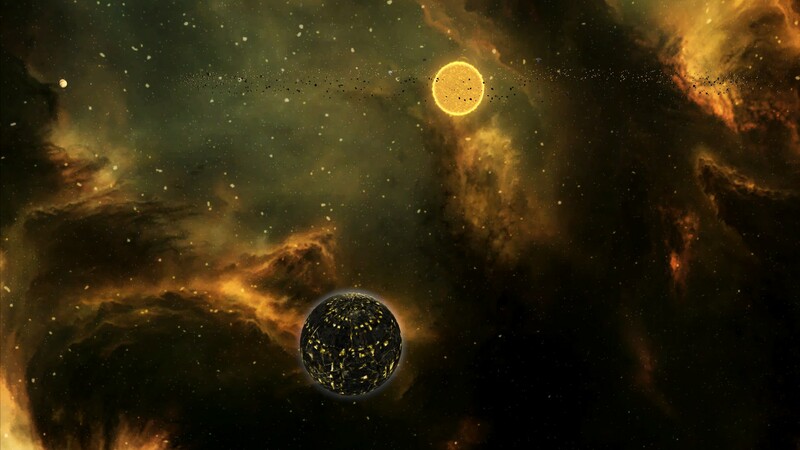 The Vaitral were broadcasting from a planet circling a star we previously assumed had no bodies orbiting it. A research vessel was dispatched. So Maestro lost presidency because he spoke out against his own kind? Maestro was a Half-Scummer though. In post 240, Cheery Dog wrote: So Maestro lost presidency because he spoke out against his own kind? Yeah I'm not entirely sure what happened there lol. The SIS Darwin jumped into the Vaitral star-system. It located the planet described by them, and traversed the solar system to reach it. 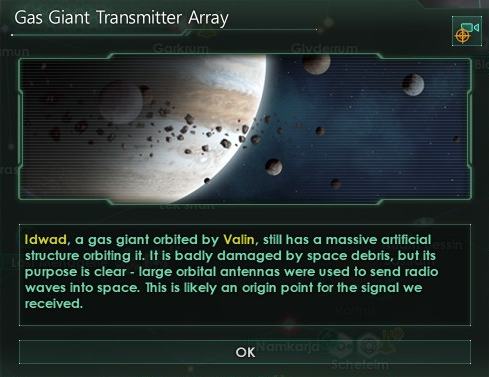 As we drew closer something troubling became apparent... our sensors picking up absurdly concentrated levels of toxic chemicals no lifeform could surely withstand. The sensors were not wrong. 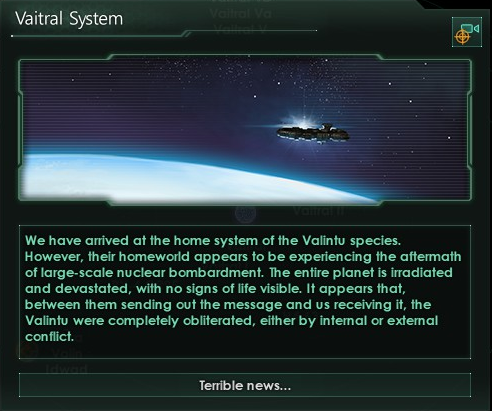 The Vaitral had ceased to exist, perished in some planetary bombardment that had left the planet irradiated and uninhabitable. As we continued to explore the solar system they once called their own we did however start to find traces and remnants of their existence. Orbital communications arrays, space-telescopes, satellites and probes littered their system. All had fallen into dysfunction lacking the maintenance of the Vaitral however, damaged and worn by the galactic elements. 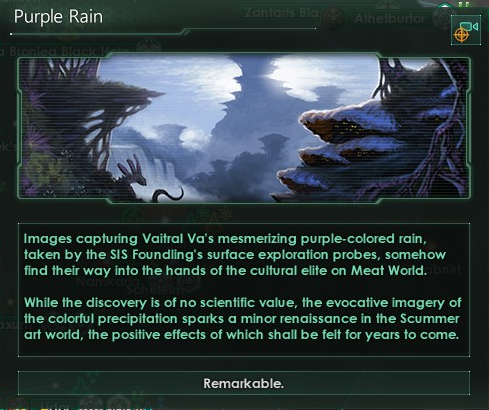 Ironically enough it wasn't the archaeological findings which interested those of the Scummer Assembly most, it was the existence of a queer planet with purple rains. The imagery of the hued precipitation sparked a cultural movement amongst the Scummeran elite, a movement which the lower classes swiftly caught on to. 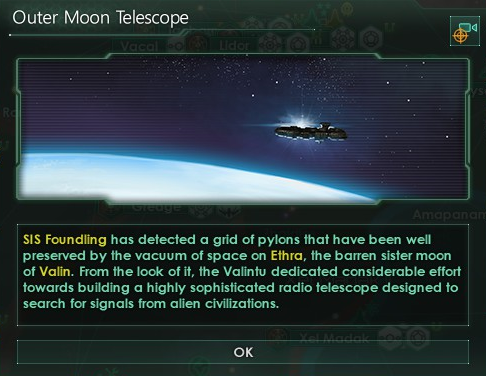 Another interesting find was the aftermath of a social experiment held upon a Vaitral' moon. 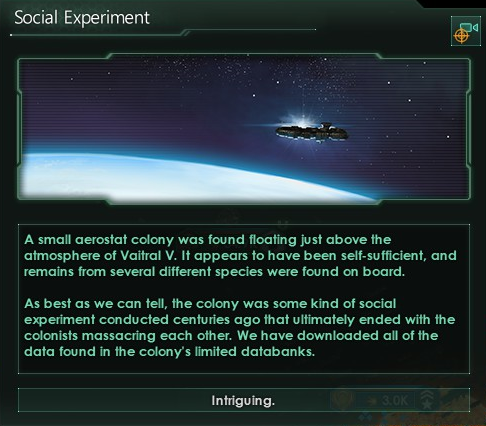 Various species had seemingly been sent to live here in isolation, eventually causing them to turn on one another and commit homicide. Although the political scene of the galaxy had rapidly changed in the prior decade it had remained remarkably stable the last ten years. 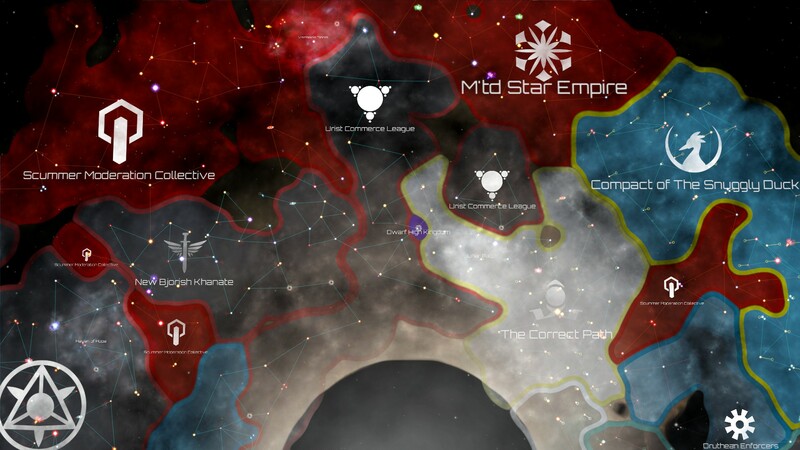 The awakened empire had declared war upon the McMenno Host and those of Mish-Mash, claiming a fair chunk of territory for themselves with ease. Particular those of Mish-Mash had no means to resist, all their resources having been depleted in nearly continuous stream of wars that had plagued them. 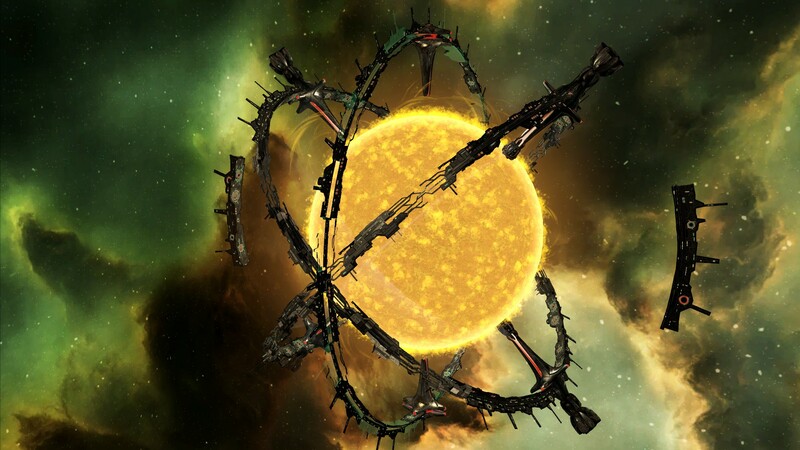 Our fleets were largely left to lie in the docks and undergo the occasional upgrade. 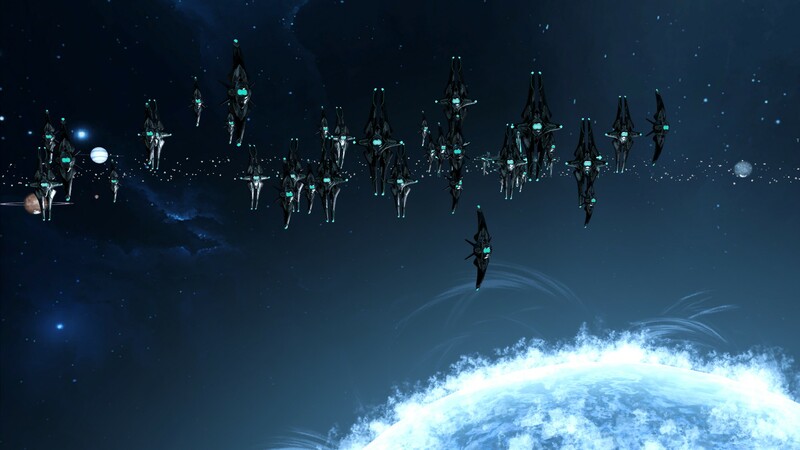 In need of some practice we sent the Archer fleet (our 3rd) to hunt down the Ether Drake and slay it. Hundreds of years ago we cowered in fear at this behemoth, now it would make for good target practice. 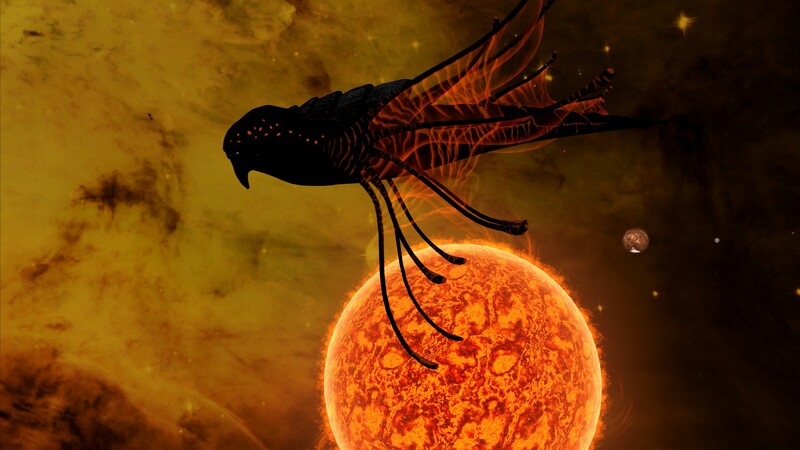 The fleet was jumped over to the Khanate's territories, for the drake resided above them. 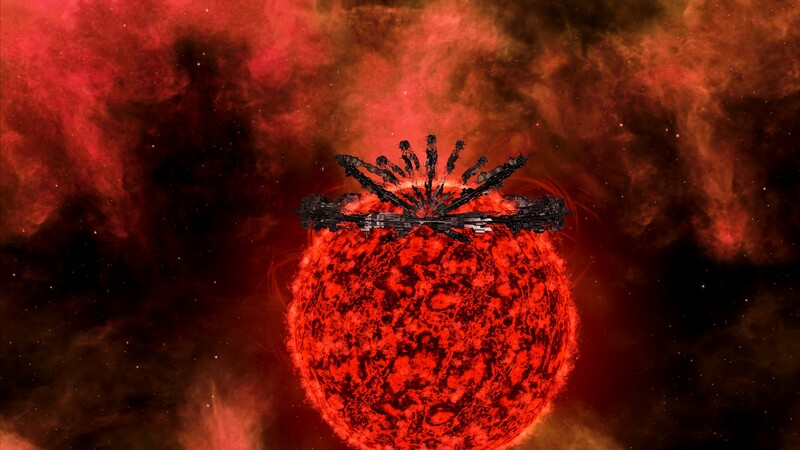 As we approached the ancient creature it displayed a startling amount of firepower, releasing a beam of superheated magma to melt a total of three battleships (along with their roughly 15.000 crew-members). It survived an admirable ammount of time under the hail of projectiles we unleashed, but eventually it perished. This weapon was solely authorised to be used in defensive-wars, and a motion was passed in the Assembly constitutionally banning any deceleration of war upon other galactic parties. Last edited by wgeurts on Fri Feb 08, 2019 7:09 am, edited 2 times in total. are we the bad guys?? You are currently building a death star. I'd say probably you are the bad guys? 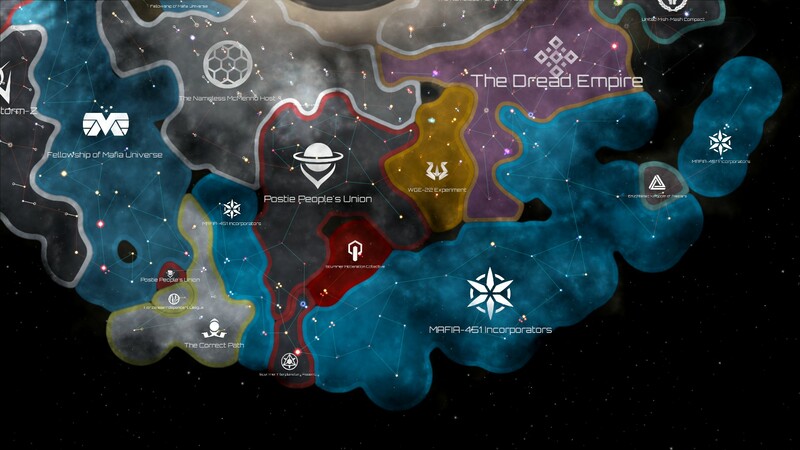 The Celestial Axis prides itself on democracy, liberty, and respect! The death star is naturally only to maintain this.